I’ve been doing Operation Christmas Child (OCC) for years and have encouraged you guys to join me doing it many times. 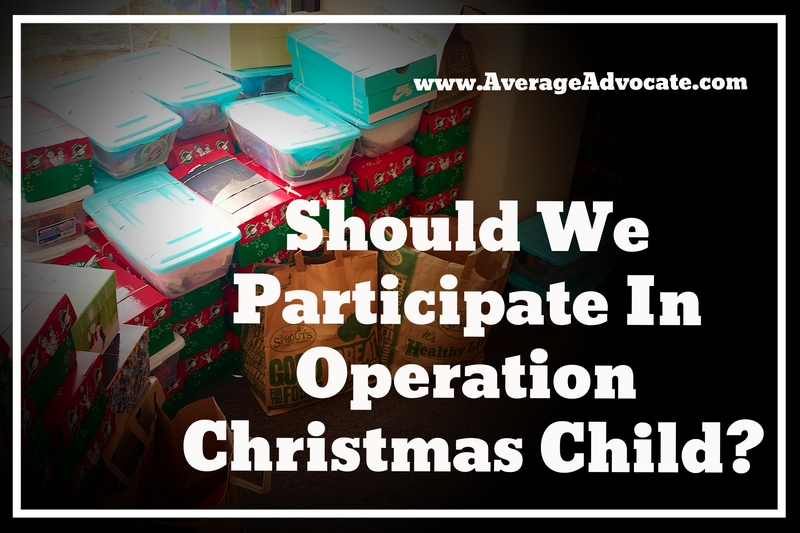 Recently I was sent a post listing Seven Reasons Not to Participate in Operation Christmas Child, challenging our assumptions about this action idea. While reading it, I immediately felt myself tense up into a great big self-defensive knot. I loved this project. I didn’t want to stop doing it! But shouldn’t I seeking to understand rather than be defensive if I am trying to change the world through humility? I know those contrary opinions required bravery to share and are worth taking seriously. I view part of my job is to make sure I am not leading my fellow world changers astray. Advocates have an excessive track history of doing “good” things that have left plenty of damage. Is OCC one of these damaging things? What about the organization behind the project–are they okay to support? Is this whole project simply half-hearted justice? Mainly, is Operation Christmas Child worth participating in? Hopefully this post will give you enough information to answer all these questions for yourself! Is OCC Sustainable Advocacy or an Offensive Imposition? Do the children who receive boxes need the stuff In them? Most OCC boxes are filled with a combination of useful things–toothbrushes, soap, washcloths, socks, hats, flashlights, rope, sewing kids, nail-cutters, writing stuff, etc… In addition, most people love putting in non-electronic benign toys (matchbox cars, stuffed animals, toy balls, etc…). I can guarantee that pretty much every box I’ve sent was full of items that would be used or enjoyed regardless of where you live–even if a smattering of the items inside weren’t great or usable. Are the toys simply Western inventions thrust upon the receiving children? The reality of toys is that they sometimes are junk and often how to use them must be taught–whether you live in the USA or Mongolia. The child might be excited to open it, but then stops caring when she realizes she doesn’t actually like the barbie or know what to do with the remote control car. At one point, slinkies, silly-putty, playdough, marbles, card games, etc… had to be explained. Sometimes, after the initial elation wears off, the toy breaks or the child loses interest. Or mommy is annoyed by the junk and throws it away. Often, the toy/game “clicks” months (years) after the child initially received it. This is all normal. The point is, that no toy and no box is going to be perfect for any child. We don’t know if it is cold or hot where the box is going–do they need socks and mittens or flip-flops? We don’t know the interests of the child. OCC boxes are generic. And that is okay. Because most of the box isn’t toys, but useful items. And besides, the point is to show them love through a gift and letter, not meet all their needs (although that would be ideal). Regardless, I highly encourage you to check out this post, covering what the best items are to put in an OCC shoebox from the those on the field. For example, I would have never thought of bowls/plates or a deflated soccer ball. Action Question: If you decide to participate in OCC, what could you put in your box that will be more likely to be used and enjoyed by someone from a different culture? Does Operation Christmas Child hurt the local economy? I feel like this question is really worth considering, challenging us along the lines of When Helping Hurts (a book I encourage every do-gooder to read). This goes back to whether our good intentions actually are harming the local economy and keeping it from becoming self-sustaining. Our goal as advocates is to help people break out of the cycle of poverty and violence rather than just give aid. For example, much of Africa is unable to develop textile industries because Westerners keep pawning their used clothing off on them. This might be a good place for old clothing to go, but at the same time, it removes opportunity for industry that could give jobs. On a local level, an influx of goods can wipe out a business by removing the demand. Does Operation Christmas Child create so much of a supply that the local businesses are affected? I doubt it. The boxes have such a wide variety within them, they are luxury items, they would need to be replaced often, and they are given to children, who both grow quickly and break things rapidly. All these factors point towards OCC being an unlikely shut-down on total market demand. But, if there was evidence of hurting the local economy, we should definitely pay attention. Unfortunately, OCC doesn’t support the local economy either, which is ideal in advocacy projects. Action Question: Is it worth the risk to participate in OCC even when you don’t know what the local humanitarian dynamic is where your box is going? Does OCC encourage those in the cycle of poverty to depend on the rich world? One other thing we would not want is for OCC to perpetuate an unhealthy expectancy from outsiders. Even if there are those lucky enough to receive an OCC box every year, the contents itself don’t qualify for relief aid on their own. This is similar to how I depend on a specific house while trick-or-treating for the best Halloween pass-out. OCC boxes are gifts, neither development work or full relief aid. Considering, the possibility OCC boxes might contribute to an already unhealthy dependence on aid is something difficult to recognize, let alone condemn as it is more inconsequential. To be clear, this negative effect wouldn’t be perceived as negative, but positive. But, it would only happen in locations that have only been receiving relief aid for many years, with no plans of sustainable development (for example, if short-term groups are constantly cycling in, bringing workers, toothbrushes and notepads indefinitely, while never reaching towards locals to meet the need). For all we know, this might be none of the locations where OCC boxes are deliver to (or it could be 60% of them). The root problem has little to do with OCC and much more to do with the types of long-term work, such as the organizations and projects of missionaries already at play in the area. Those are the foundational pieces that create a culture of dependency. Action Question: When you invest in humanitarian aid, do you consider if your monies will be going to projects that break the cycle of poverty? Are the OCC shoeboxes sexist? If you’ve ever spent time with people in poverty, you will quickly see how things like gender stereotypes can fall to the wayside. Clothes are clothes. Flashlights are flashlights. The primary concern of most children in poverty is not about whether they feel more inclined to own a pink or a blue pencil, but whether they have a pencil at all. The goal of OCC is to love children through generic gifts, not perfectly individualized gifts. But still, I cringe when I think that the kids might get stuck with boxes that really different from what they saw their friends get (pretty sure the majority of the boys don’t want to be receiving nail polish). There have been numerous times I’ve written on my box “gender neutral” in hopes that it might give the person passing the box out a clue that it could be used for the 20 boys who showed up (when they had 20 girl boxes). Personally, I feel like OCC makes much more work for themselves by not having gender neutral boxes. Having been part of projects organizing gifts to large amounts of people, trying to add in gender preferences along with age generalities can create an even greater logistical nightmare. This seems so unnecessary, especially when it would be so easy to make gender neutral boxes (as you can tell, I have made them many times regardless). I am not sure what OCC’s reasoning is behind not also having gender neutral boxes, so maybe we should ask. Are the OCC shoeboxes racist? The characters on the boxes and some OCC material shows little children in different global costumes. Are these stereotypes offensive? Although I’ve seen many Mexican’s in huge wide-brimmed hats, it is true that I don’t usually see them in sombreros. Who Runs Operation Christmas Child? Is Franklin Graham evil (and does it matter)? This is a very valid question. Franklin Graham, the son of esteemed Billy Graham and CEO of Samaritan’s Purse (which runs OCC) is very conservative Christian both politically and socially. As such, it doesn’t surprise me that he expresses anti-homosexual sentiments or other very right-wing perspectives. It is his worldview. For all I know, he might be the only person mad about the only red Starbucks cups (go to his feeds to find out because I sure didn’t check). I know I wouldn’t become best friends with Franklin Graham. Not only would the age/gender thing be weird, but we just don’t agree on everything. In addition, I do feel like he has used his publicity to share his views in an unloving way. But he is just a person, on his own journey, and no different from many other friends I have who use their platforms to say things I find hateful, rude, or just generally disagree with. Lots of times connecting over things we do agree on–like maybe a do-good-project–is where change begins. Just because I disagree with others doesn’t mean I think they are always evil incarnate (especially when they aren’t leading me or forcing me to do something). In the same way, the little I know about Franklin Graham hasn’t forced me to a tipping-point that says I must disassociate from him and everything he touches (i.e., Samaritan’s Purse’s OCC). Despite your personal feelings about CEO Franklin Graham, I think the greater concern should be about Samaritan’s Purse, the organization that runs OCC. I highly value a lot of what this organization is doing. Samaritan’s Purse is one of only a handful of organizations–for awhile it was the only one–working to end the current genocide crisis among the Nuba people in Sudan. Then remember back all the way to 2014 when that famous American doctor was flown to the States to be treated for Ebola? Yep, Dr. Kent worked for Samaritan’s Purse. They worked tirelessly to fight Ebola, keeping this crisis from spilling into other parts of the globe. Samaritan’s Purse is often on top of most global current events and making a difference there. How well does Samaritan’s Purse handle money? In addition, Charity Navigator, the guru organization that researches in-depth the financials of non-profits, rates Samaritan’s Purse as a four start charity (there is no five star–four is as good as it gets). The financials of Samaritan’s Purse are rated in the top tier, at 98.23, coming even above other really incredible organizations like Action Against Hunger (97.05), Doctor’s Without Borders (92.61), World Relief (89.76), Oxfam America (86.17), CARE (85.57), and Heifer Project International (85.15). Comparatively, Angel Tree, another Christmas project Americans like to take part in, is run by a charity (Prison Fellowship) that is rated a whole two stars lower, at 74.32. It should also be noted, that participating in OOC isn’t a monetary donation anyway–it is just physical items. The only money people usually donate to OCC to cover their shipping costs. Hence, one could easily argue financial responsibility probably shouldn’t be our primary concern when participating in Operation Christmas Child. Action Question: Do you feel like the organization’s pro’s outweigh the things you might not like about the CEO’s personal actions and beliefs? Is Franklin Graham himself a crook? Now this is a valid question! As for how much Franklin Graham makes, I will say right off the bat that he brings in a ridiculous amount of money. According to this article, his combined income from Samaritan’s Purse and from the Billy Graham Evangelistic Association equals $880,000. I think it is a little sneaky Franklin Graham is garnering an income from two different non-profits and this fact is legit. But does he really make that much as that article says? The original GuideStar source in the article shows the same amount ($440,927) as Charity Navigator declares, both from 2013. But this source from Forbes is where I assume the 622K number originated, but it doesn’t say specifically whose income it was and dated both 2014 and 2013 on different places of the article. Regardless, it is wrong because the most current (2014) 990 form for Samaritan’s Purse says Graham’s income only went up by $3000, not $200,000. That is a pretty drastic difference! So let’s go with the number we can prove he makes–a total of about $660,000 rather than the wrongly stated $880,000. Is this still insane? Yes! Is this high income abnormal for the CEO’s of top charities? No! This, my friends, is totally separate issue that we can (and maybe should) be mad about but has little to do with whether we should participate in Operation Christmas Child. From the perspective of the non-profits themselves, they are both financially highly rated, are not compensating an unusual amount, and in actuality, are giving him a drop in the bucket of their total revenue (Samaritan Purse’s gives Graham 0.001 of their budget). And for all I know Franklin Graham could be giving 85% of his money away (although I highly doubt it). Despite the fact his wealth makes me want to gag, I do not have an inner look at his life or motives to judge him. Considering, this time I’ll leave that to God. Action Question: What level of compensation can you be okay with in the compensation a CEO of a non-profit? Then only donate to or buy from organizations which fall under your “it is okay” line. Is Operation Christmas Child an evangelical program? Yes! This isn’t hidden and is pretty much on all the information Samaritan’s Purse puts out about OCC, so this shouldn’t be a shocker. In every box Samaritan’s Purse puts a small booklet that tells Jesus story and often missionaries pass these boxes out. OCC was started as a project for churches or groups of churches to do together. In fact, this is one of the main reasons people want to support this project, because they believe it is good the story of Jesus is accessible to the whole the world (about one-third of the global population has never heard of Jesus or Christianity). One concern humanitarians have is that if proselytizing is taking place, the receiver might feel forced into adopting a belief in order to receive the humanitarian aid (and therefore they either manipulate, or hinder aid from reaching those who need it). Considering, most organizations, like Samaritan’s Purse, who are evangelical in nature aim to share what they believe without creating pressure. But, because of cultural differences, communication breakdowns, and random individuals who might not live this out, this can’t be a guaranteed. But this is something that can happen at any NGOs, secular or religious. Action Question: Do you feel the pro’s outweigh the con’s when organizations intentionally share their worldview? If giving a child an illustrated children’s book about a religious and historical character is unacceptable to you, then OCC is also definitely not for you. Is Operation Christmas Child Simply Half-Hearted Justice? Even if it hard to ask, we do need to review our motives for sending OCC boxes. Anything can be done out of half-hearted justice. If we aren’t being challenged to step-it-up a level, to give a greater percentage or get closer to those not like us, then yes, then our act of good just becomes a mark on our checklist (even if it still does a little good). We will not save the world by sending these boxes. Children will be blessed by them, but they will be okay without them. These boxes are such a minor thing in comparison to the true felt needs those in poverty are facing. If we want to provide for others effectively there are actually much better ways to do so. But, listen carefully: The beauty of Operation Christmas Child is fostering connection–provision is only secondary. Children around the globe feel something when they are remembered. When they are given a card with writing from someone in a different world. People in the rich world feel something when they give–they can track their package and imagine the individual who will receive it. 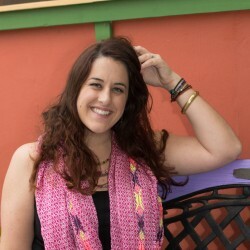 Even though most donors and receivers never actually connect, they still touch each other. In addition, it is hard to find ways to teach our children the value of empathy, compassion, and knowing there are others out there who didn’t grow up how we are. Heck, us as adults need to learn this too! OCC might not be the best way to meet the needs of the masses, but it just might be one of the best stepping-stones to mold individuals to care about others not like them, by watering the roots of justice and unselfish love. Action Questions: Do any of your motives need to change when participating in Operation Christmas Child? Are you challenged to take it to the next level as to not live out half-hearted justice? I hope this gave you the questions and facts you needed to decide for yourself whether you should participate in Operation Christmas Child! If you answered the questions and this isn’t for you, I hope you find something else meaningful to be part of. If now you are super excited about OCC, know that it is national packing week right now, so be sure make your box pronto! To help you, check out this post on Operation Christmas Child or go learn how to pack a box at the website of Samaritan’s Purse.